This interesting surname is of English locational origin from any of three places named with the Old English pre 7th Century “wicga”, an insect, plus “leah”, a wood or clearing. The first element written as “wigge” in Medieval English translated as “beetle” or “bug”, and in some instances appeared as a personal byname meaning “Beetle”. 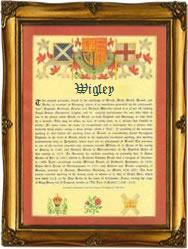 The places referred to are Wigley in Derbyshire, recorded as “Wiggelay” circa 1100; Wigley in Hampshire, appearing as Wiggeleia in the 1198 Fine Court Rolls of that County, and Wigley in the Ludlow district of Shropshire. On November 23rd 1573, Richard Wigley and Elizabeth Garner were married in Ludlow, Shropshire, and on May 4th 1588, Elizabeth Wigley married a Thomas Houlden in Onibury, Shropshire. The christening of one, Marie Wigley took place in Bramley, Hampshire, on March 25th 1599, and in 1601 Edmund Wigley of Derbyshire was entered in the “Oxford University Register”. The first recorded spelling of the family name is shown to be that of John de Wyggeley, which was dated 1292, The Pipe Rolls of Derbyshire, during the reign of King Edward 1, “The Hammer of the Scots”, 1272 – 1307. Surnames became necessary when governments introduced personal taxation. In England this was known as Poll Tax. Throughout the centuries, surnames in every country have continued to “develop” often leading to astonishing variants of the original spelling. I’m descended from the Derbyshire Wigleys.